AFL-CIO President Richard Trumka and IBEW President Edwin D. Hill announce  “Workers Stand for America” campaign at a National Press Club Newsmaker, July 12, 2012. Second Bill of Rights," an effort to draw attention to the economic issues facing America workers, labor leaders said Thursday at a National Press Club Newsmakers event. "We once took many of these rights for granted," AFL-CIO President Richard Trumka said. "Now we're compelled to reassert the rights of people who work and we ask for the support of all Americans." 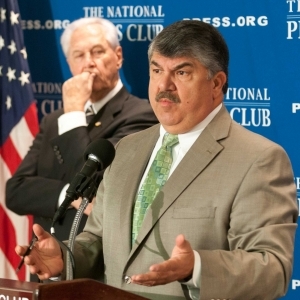 Trumka, who was joined by International Brotherhood of Electrical Workers Edwin Hill, said that the platform seeks to guarantee full employment, a living wage, the right to collectively bargain, better access to education and health care as well as the guarantee of full Democratic participation to counter Republican efforts to enact stronger voter identification laws. urged Democrats not to host the convention in North Carolina since its laws do not protect unions. Trumka said, however, that the AFL-CIO may play a smaller role in 2012's Democratic convention compared to previous years. The labor leader said the AFL-CIO would not help Democrats'pay for the convention nor would it host "extravagant events." Labor leaders will promote the labor "bill of rights" at both conventions and that DNC Chairwoman Debbie Wasserman Schultz, D-Fla., supports the bill and will participate in the Philadelphia rally, Trumka said.